Well, it’s still warm. What has happened to our usual British Summer? The one week of sun and then a few weeks of extremely temperamental rain, sun, storms, humidity and god knows what else. I was really hating it and then my parents decided to get a Lay-Z Spa. You’re probably wondering what the hell that is, it’s just a posh name for a blow-up hot tub. It’s been a god send for just popping in and out of throughout the day and it’s going to make a feature in this post too because who wouldn’t sip cocktails in one? 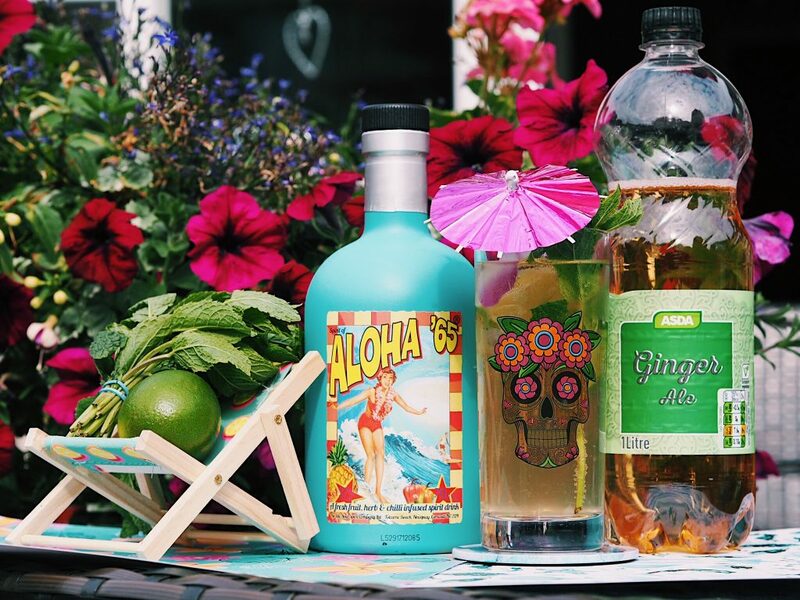 Aloha’65 was born in the 90’s in Florida and was used as a way to bring people together and really get the party started. You can tell by the bright contrasting colours, the design and the beachy vibes that it was created with having fun in mind. It’s not a gin nor a vodka but a spirit for everyone (18+ of course) with 100% fresh and natural ingredients including pineapple, ginger and scotch-bonnet chillies. I know what you’re thinking, what a daring mix of ingredients. Being completely honest, I was extremely apprehensive about the sound of this drink to begin with. I first tasted Aloha’65 at a promotional event for it back in May. We were offered a shot of it on entry and then their signature cocktail “The Idle Lord” throughout the evening, both of which me and my partner Jake REALLY enjoyed. 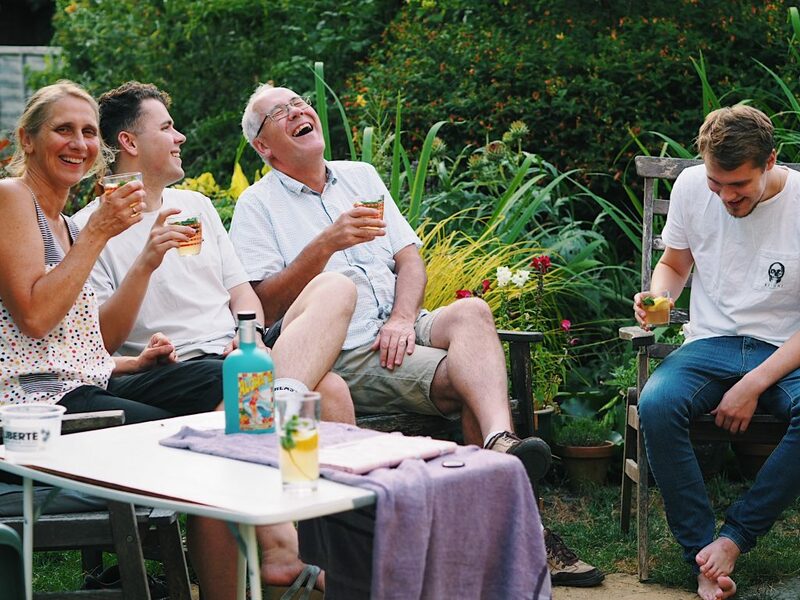 So much so, we ended up having a brilliant chat with the owners about the creation of and inspiration for the drink. For these reasons, I was really excited to create this content and become well acquainted with Aloha’65. 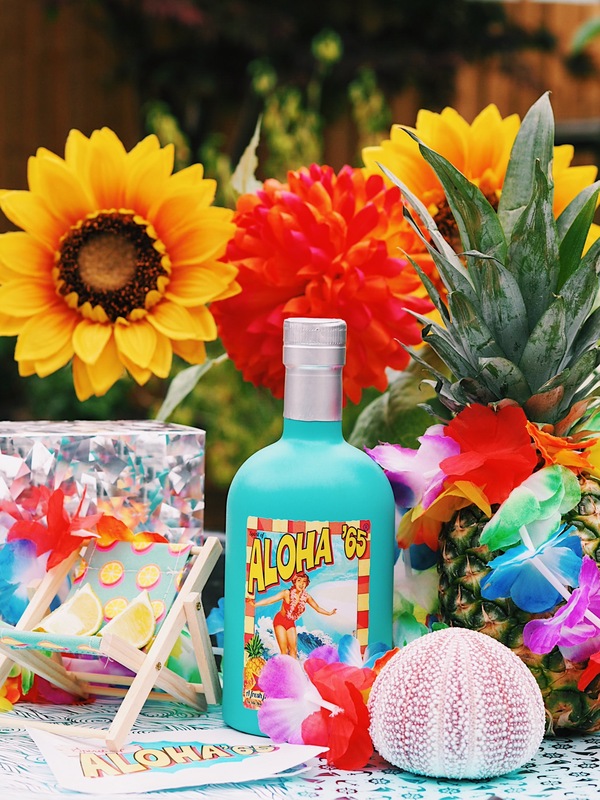 I’ve put together three different cocktails for todays post – all of which I have taken from the makers of Aloha’65 themselves so all credit goes to them! One cocktail contains: 50ml of Aloha, one lime wedge, a sprig of mint and ginger ale. 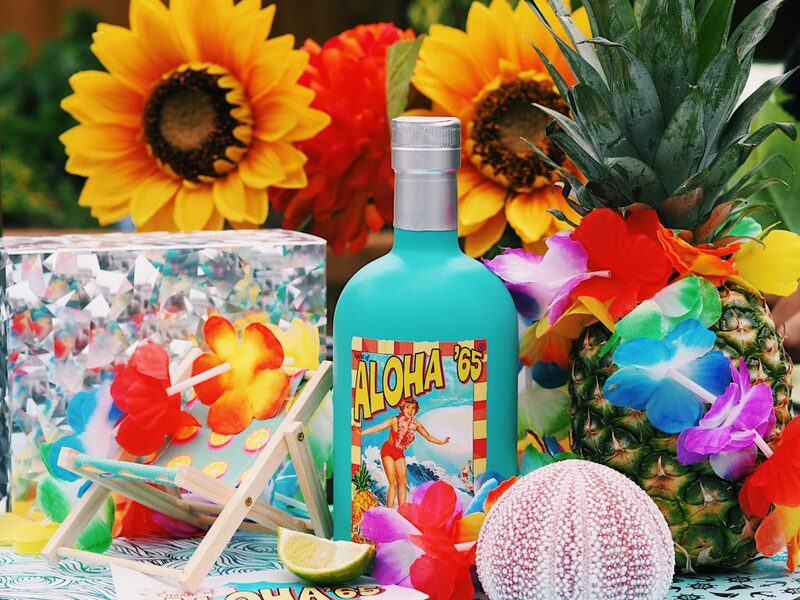 This cocktail is the original and signature mixture created to enhance the spirit of aloha. It’s super simple to make with minimal ingredients but that doesn’t reflect in the gorgeous taste. The ginger ale really accentuates the warmth of the spirit that also contains ginger. The lime also adds a needed drop of sourness to give it a kick and some extra character. The only problem is, it goes down far too easily! Before you know it, nearly the whole bottles gone… (that totally didn’t happen, maybe). 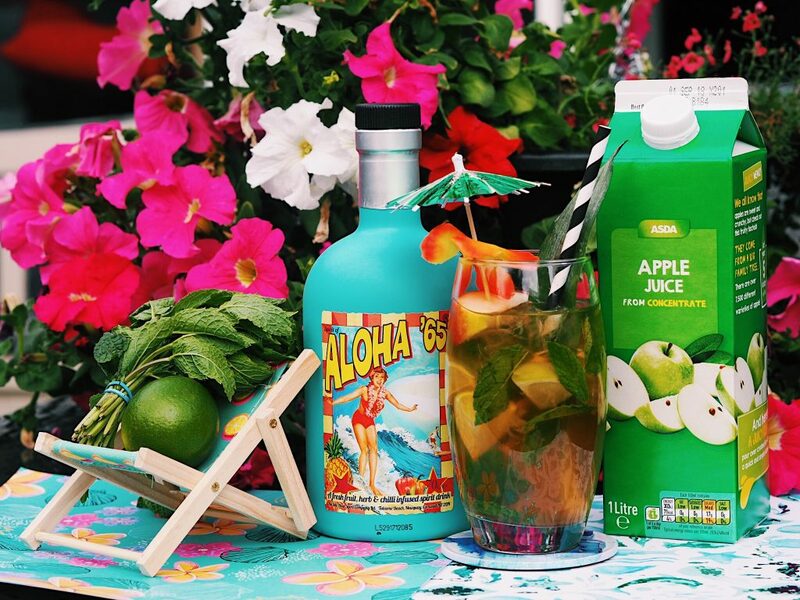 One cocktail contains: 50ml of Aloha, 4-6 lime wedges, 9 mint leaves, a pinch of sweet cinnamon and apple juice. Admittedly, this is my absolute favourite of the three. Originally I wasn’t too sure whether the apple would work but boy is it tasty. The vibe is slightly sweet and sour from the lime and apple juice but warming and spicy from the aloha and cinnamon. It’s actually unlike anything I’ve tasted before in the best way. Strangely, I could imagine this being really nice as a warm drink, too. It’s definitely a taste that’s suitable for all year round as I feel the sweetness represents the summer and the warmth, the Winter. 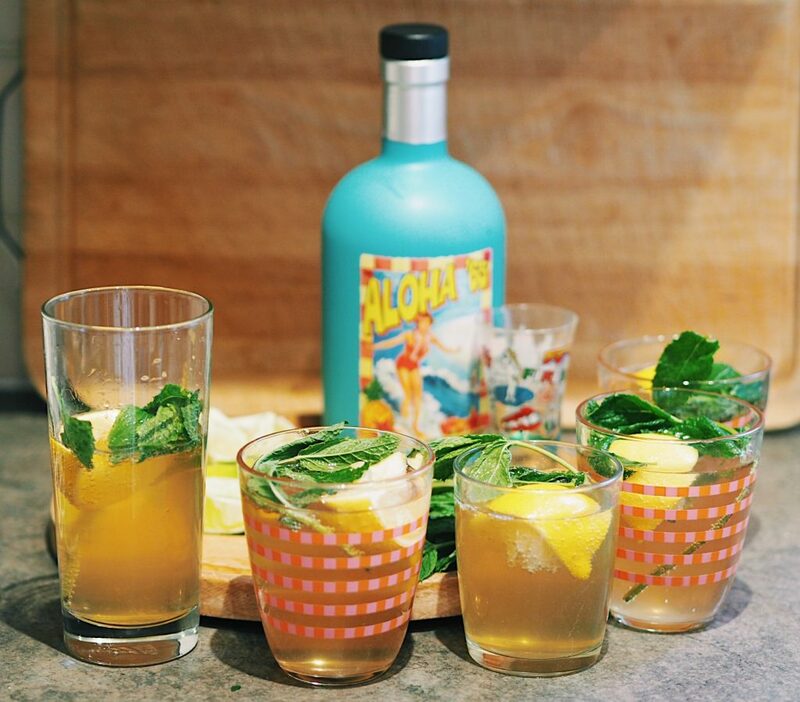 One cocktail contains: 50ml of Aloha, 20ml of raspberry cordial, wedge of lemon and lemonade. The gentlemen behind the company originally put chambord and a coconut syrup in this recipe. I’m not personally the biggest fan of coconut and I already had some raspberry cordial at home so I decided to make my own version. This one, as you can probably tell, has a more fruity kick to it. This is a lot more suitable for those of you who prefer sweet over spicy. The raspberry and lemonade in the drink slightly dampen the strength of the spirit and make it a lot more subtle. You still get the lovely base notes of the ginger and pineapple though. As I wanted to share the unique taste of this drink with some others and get their verdict, I decided to make some cocktails for my boyfriends family. I of course went for the famous favourite, The Idle Lord. I told them that the spirit had 4 main ingredients and to see if they could guess what they were. After having a few sips and pondering the flavours for a short while, they discussed the ingredients possibly being being pineapple, ginger, melon and “something citrus”. Isaac, Jakes brother mentioned he felt there was sort of a pear drop flavour to it as it held a lot of sweetness. Jake was slightly convinced there was an element of coconut in there but soon dismissed the idea when I reminded him that coconut was more of a creamy taste. I decided to tell them at this point that there was one very unusual ingredient in there. They weren’t convinced on their choices yet so tried the spirit straight. Following this, they settled on the spirit containing pineapple, ginger and lime being the hint of citrus. Gill, Jakes mum, could tell there was a clear element of heat that was a bit too strong for the likes of Ginger alone. This triggered everyone else to agree and vote for chilli as the “unusual” addition. I couldn’t keep a straight face when Andrew, Jakes dad joked about it being scotch bonnet as of course, it is! I’m really very impressed that they managed to guess all of the ingredients as although the spirit is gorgeous and holds a lot of depth, I can’t say I’m the best with defining tastes. Their opinion of it is that it’s an incredibly interesting drink and they thoroughly enjoyed the heat and felt it had a sort of burnt toffee aroma to it. They preferred the drink neat than in the cocktail and said they would love it over ice, possibly with a small amount of mixer. But either way, it was very enjoyable, great to try something different and they adored the design of the bottle. Loving the sound of Aloha’65? If you’re Bristol-based like me, you can purchase a bottle at Grape & Grind or it is actually available in over 100 different bars dotted around so keep your eye out for it. Otherwise, you can order it from their website here if you fancy treating your tastebuds to something new and exciting. 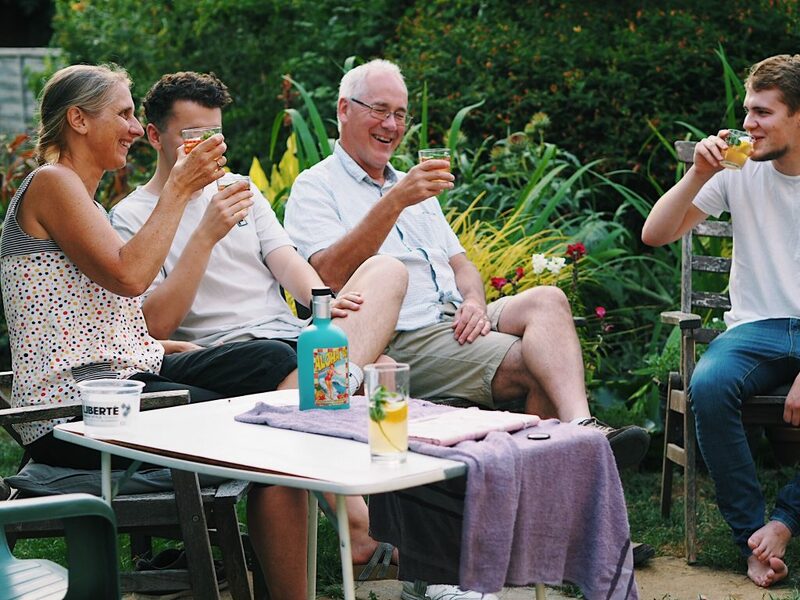 What’s your signature Summer beverage? "The HarSpa Launch: A Lavish Lunch & Luxury Treatments!" The little deck chair for the lemon is SO cute and the bottle design is adorable too, im always on the look out for refreshing drinks! 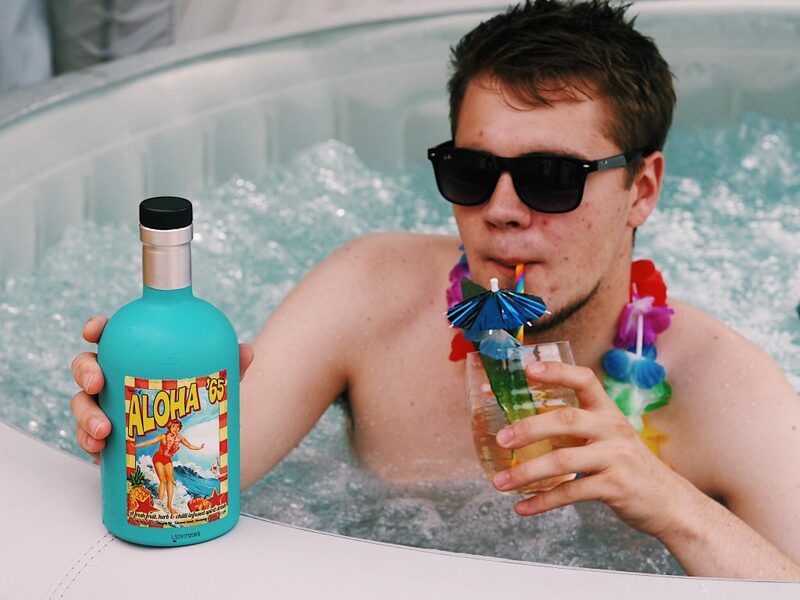 Cocktails in the hot tub in this weather sounds like absolute bliss! Love the packaging in this bottle, so funky! Photography in this post is absolutely amazing! I’ve never seen this brand but it sounds amazing and I love the packaging, which kind of reminds me of Benefit in a strange way haha! 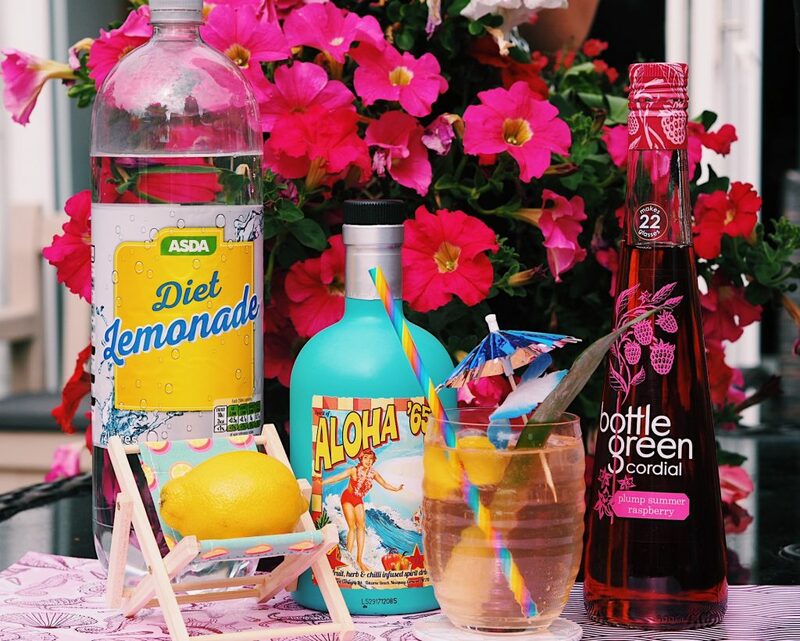 I love Summer cocktails so will definitely be trying these! I just with I had a hot tub too! We are probably on the same boat with the heatwave and all! It’s so cool that you got to do a collaboration with Aloha’65! I can feel the Hawaiian vibes from them. The cocktail mixes sound delicious! I know I’d enjoy all of them considering how mai tai’s are delish. Glad you enjoyed the drinks!! I love you photographs for your post they feel so summery and really fitting with the beach,relaxed vibe of the product. I’ve seen Aloha’65 at the shops and the bottle has always caught my eye but I have never purchased. Now that I have a few of your cocktail recipes in mind I will be picking a bottle up on my next night off and trying them out. Thank you for the recommendation. Yum, that sounds amazing. I love ginger in drinks. Have you tried Yazi? It’s one of my favorites.